Additional charges for asphalt or gravel installations. Additional charges for tables, chairs, sidewalls, and lights. 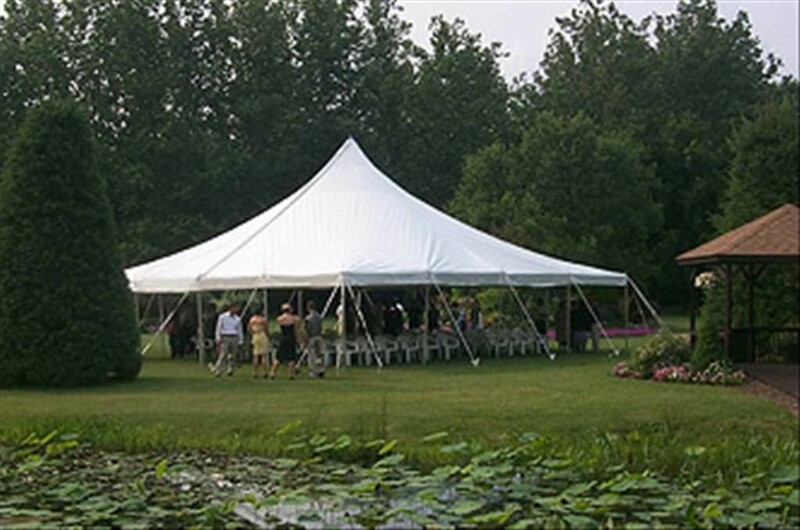 30 x 30 pole tents are a professionally installed heavy duty party tent made of vinyl and supported by poles and stakes around the perimeter and a pole in the center. The 30 x 30 pole tent is perfect for graduation parties, small weddings and small company picnics and commercial functions. Spacious interiors and higher roofs offer excellent floor versatility and design possibilities. They require a 42 x 42 space. They have one centerpole and require staking in to the ground around their perimeter. Sidewalls, flooring, and lighting can be added to achieve the right effect for your event. Basic Seating Arrangement for a 30 x 30 pole tent.